It's like this: yesterday I went off on the mushroom foray in the morning, and the fungus fest in the afternoon. Steve and Paul went off-roading. Mira, just as pleased that were we all out of the way for the day, worked on reports. The weather report was calling for rain later in the week. Today's option is to go off-roading, this time with the used 2006 Lexus GX470 rather than the UTV that the men took over the California Gulch Trail yesterday. 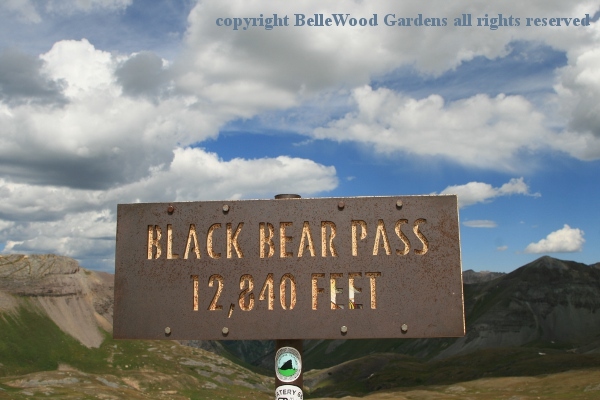 Steve thought that Black Bear Pass Trail sounded interesting. the trail is rated 10/10 for scenery, spectacular that high up. 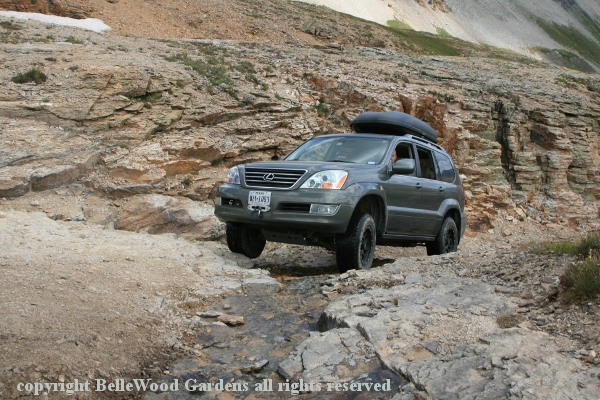 Here's what the off-roading guide books have to say about it. 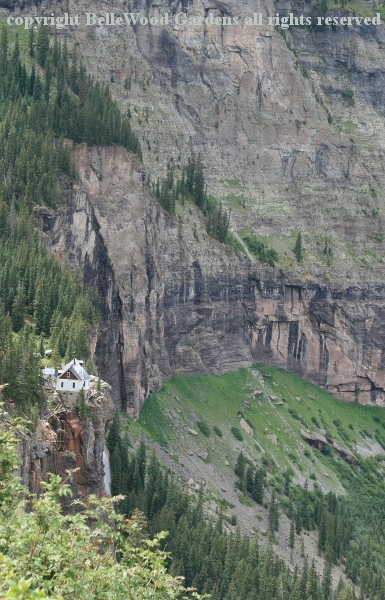 Ouray / Silverton to Telluride. 2 - 3 hours / 10 mile unpaved portion. Elevation 12,840 feet. That's where you cross the pass. We'll be ascending from 9,000 feet. Difficult - expert/experienced only. 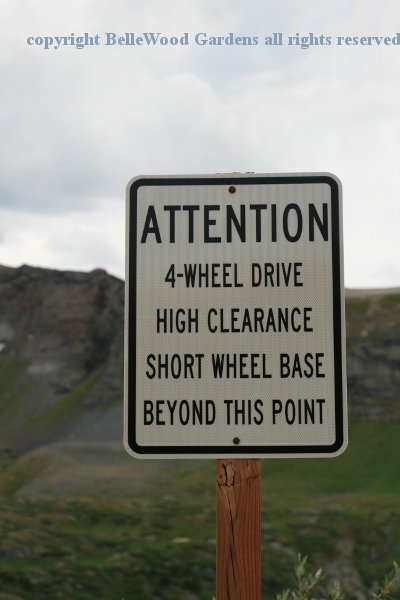 High clearance / 4 wheel drive vehicles required. 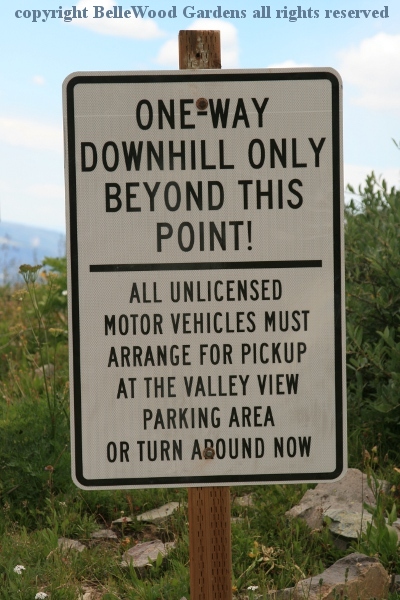 Trail not suitable for full-size vehicle due to the very tight, off-camber switchbacks, loose talus, and narrow shelf roads with thousand-foot plus drop-offs. Difficulty rating 6/10. 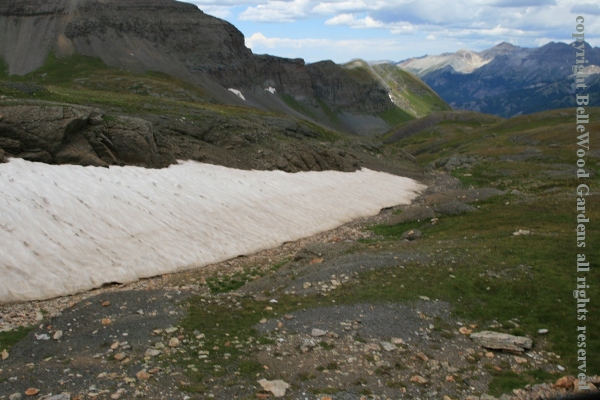 Because of the difficulty of this section, known as "The Steps," local 4WD rental businesses do not permit their vehicles to cross this pass. 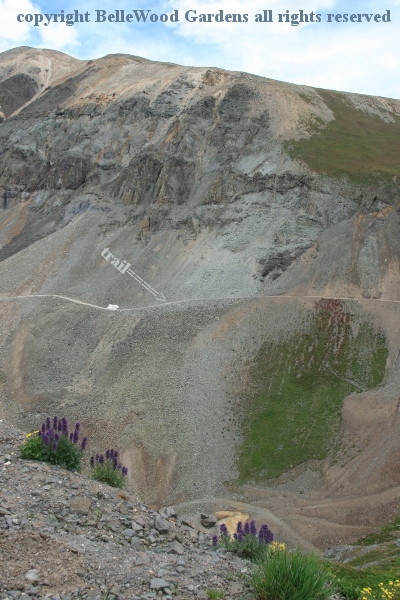 One-way from Red Mt Pass to Telluride. Usually open mid-July to late September. 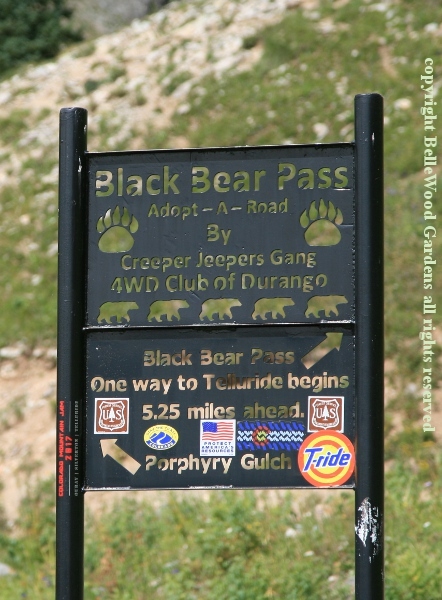 Once we got to the trailhead things very quickly got interesting. There were many more flowers than I expected to find. Steve was wonderfully amenable to frequent stops so I could slither out for photographic purposes. (The Lexus does have the recommended high ground clearance.) He was even thoughtful enough to have a small folding stool so I could step up to get back in. Barely had we started our routine - he would drive, I would say stop, hop out, take photographs, climb back in - when a teenager came sliding down the loose rock on the uphill side of the road, frantically waving at us to pull over as much as we could. A Jeep CJ7 had broken its power steering and was coming down the trail. They made it passed us - when off-roading, remember that the down hill vehicle has priority - and we then continued to head up. That down there is the trail that off roaders believe suitable for any vehicle. We're still on the trail, which is "easy" at this point, easy, that is, if you have 4 wheel drive (and let air out of your tires down to 24 pounds for better adhesion and road gripping), skid plates under the vehicle that (even with high ground clearance) scrape over unavoidable large rocks, and a driver with nerves of steel. The Lexus also has downhill assist control which periodically makes a clattering, chattering sound. We made it to the top. What's that saying - it's all downhill from here. is so good. Cold weather, snow stayed late, flowers delayed. We'll be travelling down and around over to there. backing up, go forward again to get around. 12 inches wider than the Lexus, camber towards drop. And yes, the scenery is indeed 10 / 10. Ahead I see what looks like a gnome home. Not something from Lord of the Rings. Built in 1907, the hydro-electric alternating current Smuggler-Union Hydroelectric Power Plant, second oldest in the country, was listed on the National Register of Historic Places in 1979. 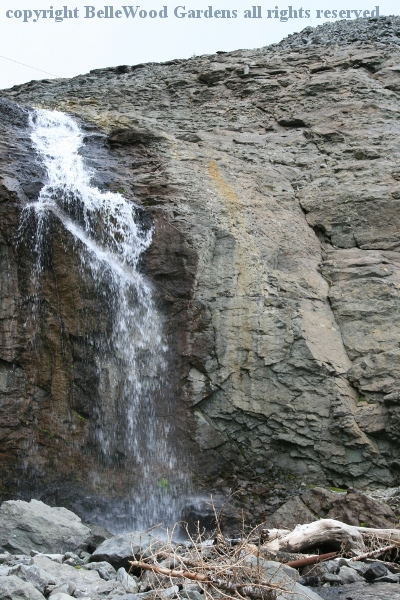 Sitting above the 365 foot drop of Bridal Veil Falls, the plant still contains its original 2300 volt Westinghouse Electric AC generator, one of the oldest AC generators still in operation. 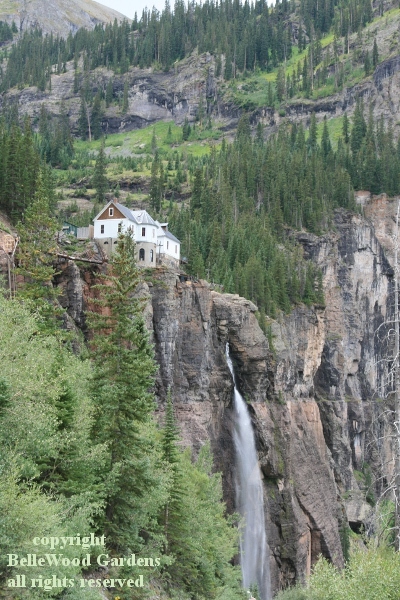 Decommissioned in 1953, restored to operation in 1991, the generated power provides about 25 percent of Telluride's demand for electricity. 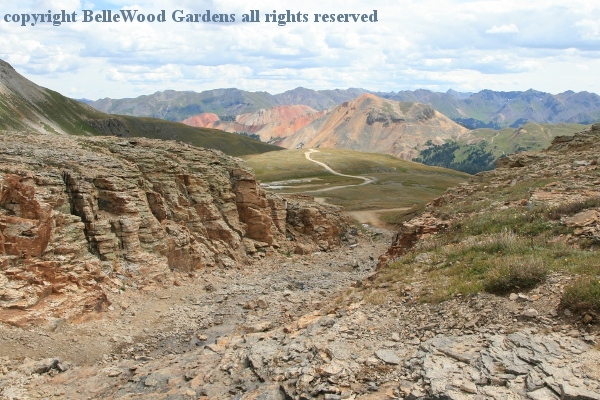 We continue down the trail into Telluride, for lunch. And yes, I did see many wonderful alpine plants in bloom.